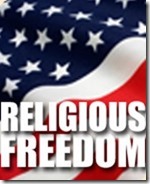 APOLOGETICA » Blog Archive » -Must Public Officials Give Up Their Religious Liberty? Must public officials give up their religious liberty? In past generations this question would have seemed to be ridiculous in the face of the First Amendment but over and over again those serving in public office are now being challenged to conform to secular and atheist notions of ‘Church and State’ rules of conduct that never came up or existed before. A few months ago, an atheist group demanded that Sen. Marco Rubio stop tweeting Bible verses claiming that it was against the Constitution. Then there was the ‘religious test’ attempted to be applied by Sen. Sanders against the appointment of a Christian over his very normal Christian views on eternal destiny and salvation. Another case in point is the doctor who lost his job as a state public health official because of some things he said in a sermon given in a church. That case will probably continue to the next level. At stake is whether Christians with a traditional view of marriage can continue to serve in public office if they publically or even privately enunciate those Christian views in print or in speech intended for friends or in a church or religious context and venue? the Madison, Wisc., group wrote Logan. Response: The implications of the FFRF letter are rather far reaching. It really is saying that public officials must give up all of their affiliations and service in Christian organizations or churches which have ‘an overtly Christian mission,’ which would include basically all churches and specifically conservative ones who maintain a Biblical view of marriage and sexuality. To most of us in the conservative Christian community this would seem to be a violation of the First Amendment and hopefully there are still some conservative judges who would continue to rule according to the original understanding of the Bill of Rights. However, in today’s America there are also an increasing number in legal circles who really do believe that public officials need to serve in an entirely secular context and give up their religious convictions and service in the process. Occasionally I make a practice of reading editorials and views on the Internet from ‘the other side’ in order to get an understanding of where we may be heading in the future. There is a prevailing understanding among atheists and secularists that public officials must be forced to give up their religious liberty in the assumption and service of their offices. Particularly, there is the notion being kicked around that conservative Christian should be barred from office and public positions if they continue to hold to traditional Christian views on marriage and sexuality. We would contend that this position is directly against the Constitution and First Amendment. Look for the battle to continue and actually intensify over this issue in 2018. A major battleground will be over President Trump’s appointments to the federal bench. The Senate in 2018 is turning towards the left and it will be much harder for conservatives to be approved next year. Having said that, the ‘war’ over religious liberty would have already been over if Hillary had won.